gentile cliente, grazie per averci scelti e recensiti, Vi aspettiamo presto per una nuova esperienza. augurandoVi Buona Domenica salutiamo con affetto. My dog was only allowed by exception. I think this is antiquated behaviour! And it was not said on Trip Advisor! Thank you. Dear guest we are terribly sorry that our reception was poorly understood. The concern is that we have a little floor and a medium sized dog without even letting us warned there took some by surprise,and we never know if some of our customers at the table just off or those that will arrive may annoy. It's always difficult to know how to behave in certain situations. Anyway we will treasure your comment to improve. Hopefully though the rest of the service it been apprecied. Please come back soon for a new proof of our service and we thank you again for choosing us and helped us improve. Awesome meal and fabulous dishes. Very peculiar and precise cooking and servicing. 10/10!! Gentile cliente siamo felici che ci abbia scelto e contentissimi della sua soddisfazione. La aspettiamo presto per provare il menu' di autunno. Gentile Sign. Pepe siamo felici di aver reso la sua esperienza qui da noi fantastica, La aspettiamo presto per confermarci e migliorare ancora. 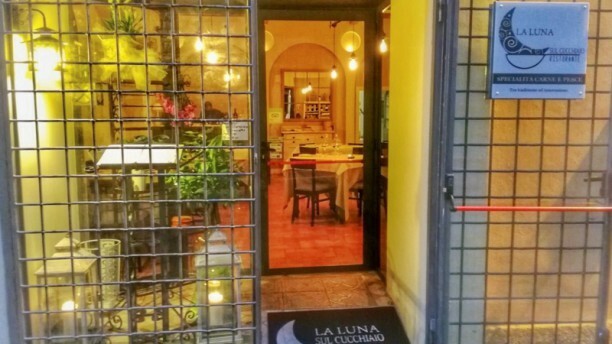 Direttore de "La Luna sul Cucchiaio"